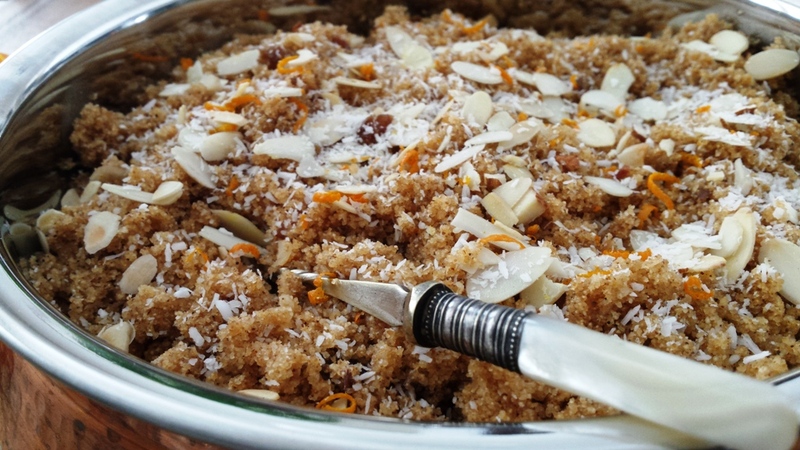 Suji Halwa is made with roasted Semolina, flavoured with cardamom, coconut, almond, ghee, cooked in sweet milk and garnished with desiccated coconut and more flaked almonds. I love making Suji Halwa or as we call in Mauritius “Greo”. Accompanied with a lovely cup of tea, Suji Halwa is a perfect treat to start the day. Suji halwa is a quick and easy halwa which is very often made in most Indian homes. 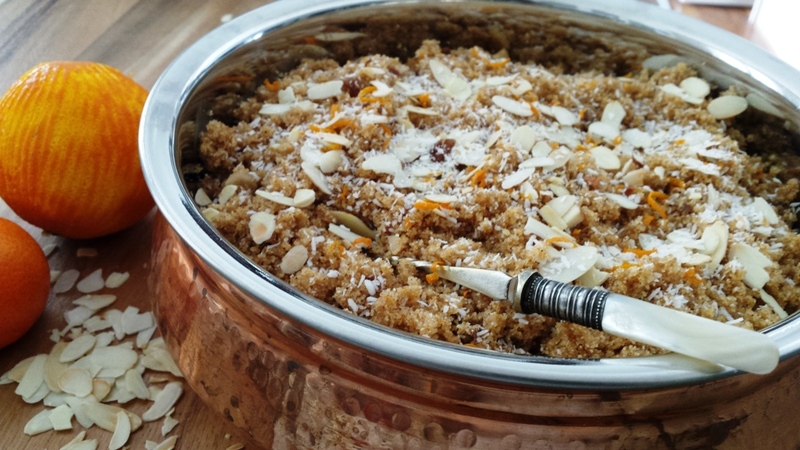 This Halwa like many other Indian sweets is prepared for special occasions, one of which is New Year, religious ceremonies and especially for any other Hindu fasting festivals. Like most of my culinary journey this takes me back to when we were all little, and my mum would almost every day make little treats like these for us after school. Weekend was no exception, waking up on a Saturday or Sunday morning with the sweet smell of something delicious wafting through the house was enough to get us out of bed. Mum never waited for special occasions to make “Greo” for us, I guess everyday was a special day when a mother wants to treat her children. Made with roasted semolina this halwa was such a treat blended with ghee and all the other ingredients not to forget mama’s love. I always used to watch my mum cooking, so this is mama’s recipe with my little twist to it. My pleasure to share an old recipe that is very much liked by many. You can add Saffron “Kesar” strand to it as well. In a mixing bowl, add the roasted semolina, sugar, cardamom powder and mix to combine all. In a heavy pan, melt the ghee/butter; add 2/3 of the chopped almond. Fry them gently taking care not to let them burn. Add the cinnamon stick and chopped sultanas. Turn the heat on low. Add the milk; be careful as it might spit. Give it a good stir. As it starts to boil, slowly add the dry ingredients stirring regularly until it absorbs all the liquid, this will happen very quickly. Add some of the orange peel/rind. Turn the heat off add the reserved tablespoon of butter or ghee, Stir well. 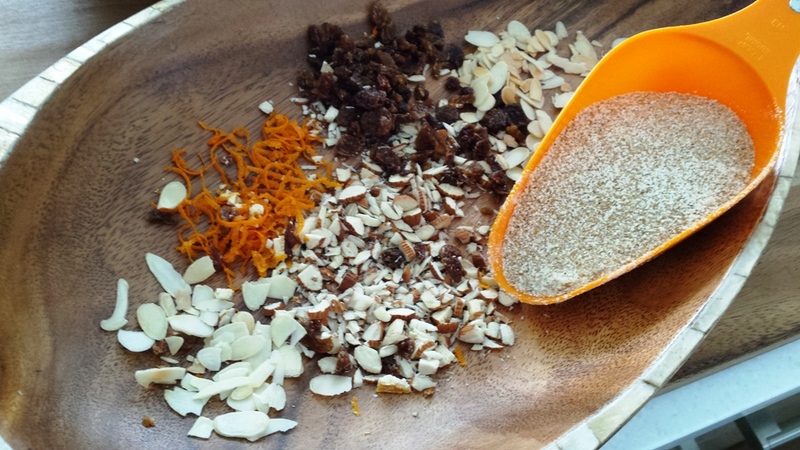 Transfer into a serving bowl, scatter with more desiccated coconut, almond and some of the orange rind. Suji Halwa can be eaten warm or cold. It will keep well for 2-3 days in the fridge. Brinda’s Note: When I make these I always make some extra for my day time snack. As it’s made with semolina, it’s quite a wholesome anytime snack, instead of eating other unhealthy nibbles. A great vegetarian Gluten free dish.